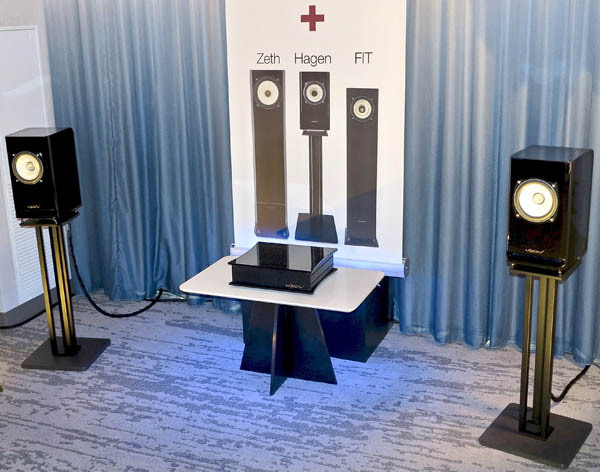 Voxativ’s deceptively simple-looking Absolut Hagen System ($7900 with Voxativ speaker cables), which consists of a Voxativ Absolut Box 30Wpc class-AB integrated amp, complete with custom DAC with DSP, Wi-Fi and Bluetooth aptX, and a pair of Voxativ Hagen single-driver loudspeakers, took advantage of a Samsung S10 Android phone to stream music wirelessly from Qobuz via aptX Bluetooth. The Absolut Hagen System, which used optional Synergistic Research cabling in the demo, can stream files up to 24/192. Thanks to built-in DSP, it is claimed to descend flat to 45Hz. Surprisingly, the system’s sound on Ane Brun’s “Halo” was very smooth, warm, and much nicer than I had expected. Even more astonishing was the wonderful sound on Musica Nuda’s cover of The Beatles’ “Come Together.” If I wasn’t taken by the first selection I heard, soprano Anna Netrebko’s performance of Puccini’s “O mio babbino caro”—the aria I whistled as “The Voice of Woodstock” in the Emmy-nominated Peanuts cartoon, She’s a Good Skate, Charlie Brown—it’s mainly because her grand diva approach is all wrong for the music. Granted, her A-flats were glorious, but the singing lacked steadiness and sounded a bit dowdy lower in the range. Happily, the sound on the other selections was so good that Netrebko’s missteps soon passed me by. I can’t believe it. I ended the show listening to a classic by The Beatles. As tired as I was, I left the Voxativ room remembering dancing to The Beatles in the basement of Amherst College’s Alpha Theta Xi, and realizing how much happier I am now than then. I can’t attribute that entirely to great music, but it sure has played an important part in my transformation. Here’s to many more decades of great sound. May the joy be with you.